Libations left over: Save the shots for later because you'll get plenty eating the cookies! A few years ago I had to make a 50's-inspired dessert for a "Mad Men" party, and rum balls kept popping up in my research. 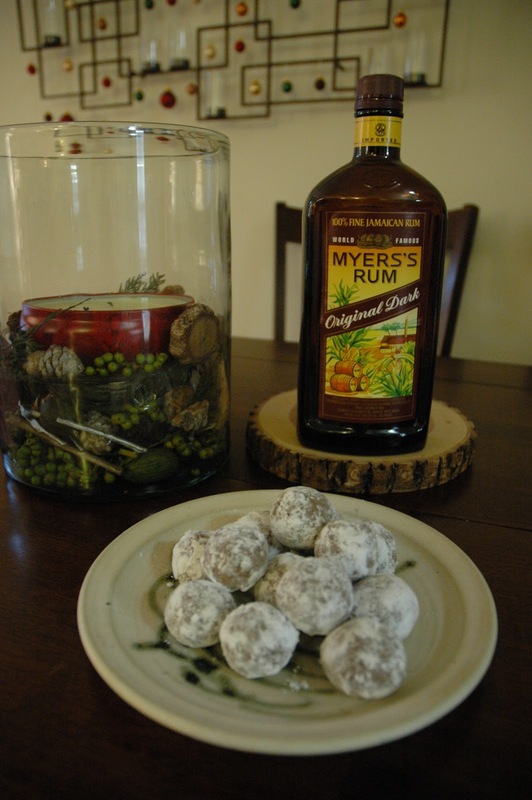 There's nothing like a rum shot in cookie form to really get that holiday office party going. Having a few of these might induce some tipsiness, so be sure to warn people before they start popping them like candy. I love this Emeril Lagasse recipe that includes cocoa and allspice to give it that Christmasy kick. I actually add more confectioners sugar to the mixture so it isn't so sticky and gooey when you're rolling it into balls. They don't take long to make, so they're perfect for toting to all your holiday parties and will last in your fridge for up to 2 weeks. - In a large bowl, sift together 1 1/2 cups confectioners sugar, cocoa powder and allspice. - Stir in the rum and corn syrup. - Stir in wafers and walnuts and mix well. - Place in fridge for about 30 minutes to firm up - the mixture will be a little dry and crumbly. - Place 1/2 cup confectioners sugar in a small bowl. - Make 1 inch balls (you'll have to really work the mixture together) and roll in sugar. - Place in 1 layer in an airtight container and refrigerate overnight.